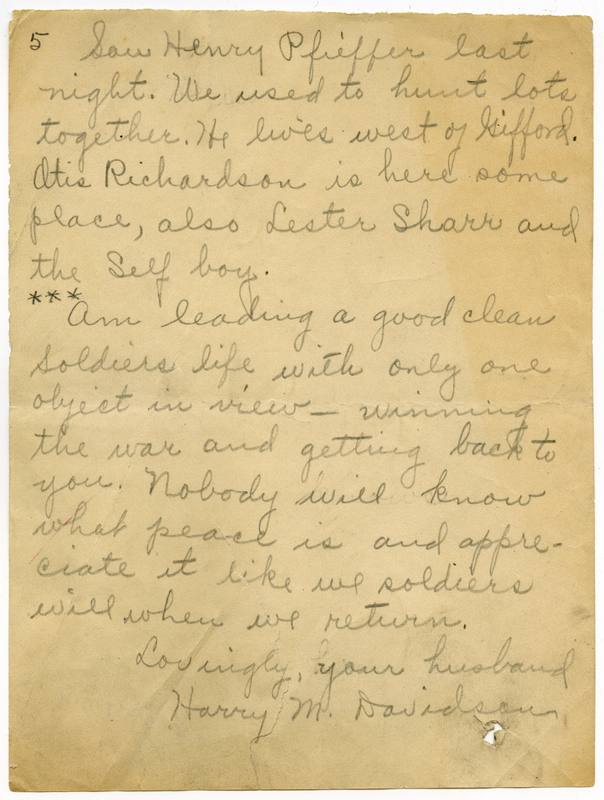 To Mrs. Harry M. Davidson. 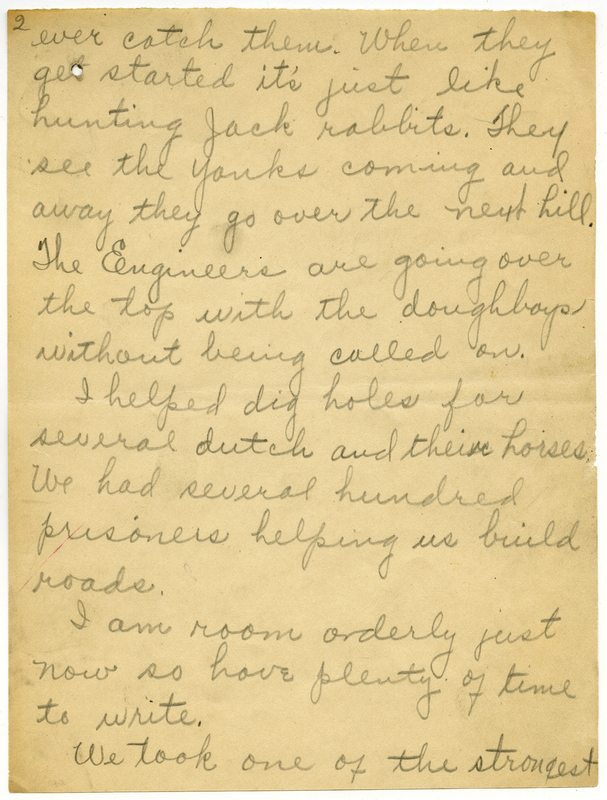 Courtesy of Pickler Memorial Library, Special Collections. Msv1_D1. 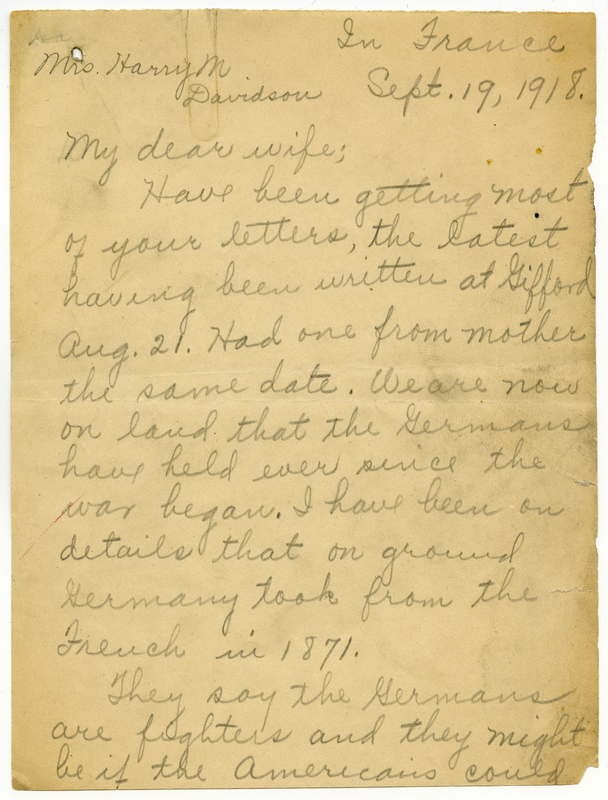 Have been getting most of your letters, the latest having been written at Gifford Aug. 21. Had one from mother the same date. We are now on land that the Germans have held ever since the war began. I have been one details that on ground Germany took from the French in 1871. They say the Germans are fighters and they might be if the Americans could ever catch them. When they get started it’s just like hunting Jack rabbits. They see the Yanks coming and away they go over the next hill. The Engineers are going over the top with the doughboys without being called on. I helped dig holes for several dutch and their horses. We had several hundred prisoners helping us build roads. I am room orderly just now so have plenty of time to write. We took one of the strongest points there was in No Man’s land. One position we took cost the French several thousand men to hold it seventeen minutes. It was easy for the Yanks. All the boys have plenty of souvenirs from the Dutch. Can get anything we want. 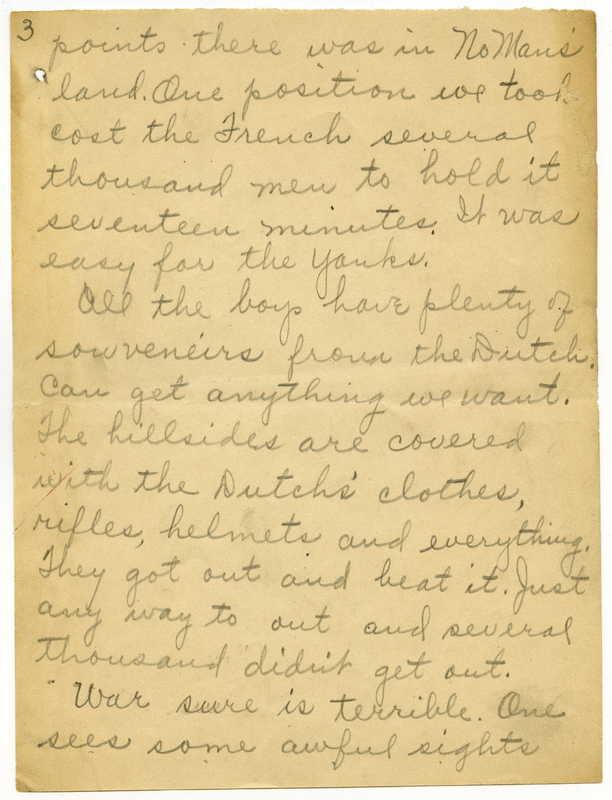 The hillsides are covered with the Dutch’s clothes, rifles, helmets and everything. They got out and beat it. Just any way to out and several thousand didn’t get out. War sure is terrible. One sees some awful sights and it’s wonderful how our boys got out of the drive without loosing any more than they did. It sure will be a great day when it is all over but there isn’t a one of us but who is perfectly willing to stay it out and make the Dutch be human beings. I don’t think it will take us long and I still feel that I’m coming back to you. Have had several close calls but am still safe and sound. Have had shells light all around me make holes large enough for a good sized cellar. Saw Henry Pfieffer last night. We used to hunt lots together. He lives west of Gifford. Otis Richardson is here some place, also Lester Sharr and the Self boy. ***Am leading a good clean soldiers life with only one object in view — winning the war and getting back to you. Nobody will know what peace is and appreciate it like we soldiers will when we return. Msv1_D1. 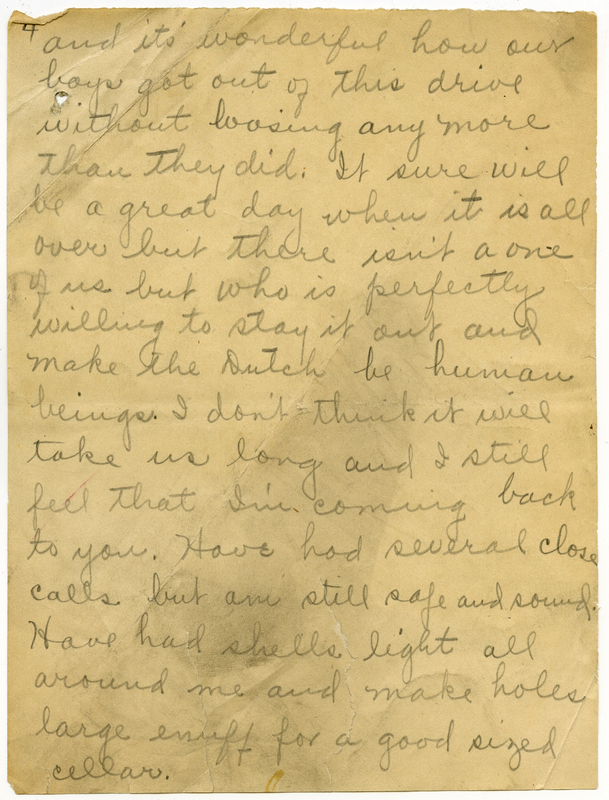 Violette Collection of WWI Soldiers’ Letters. Mudsp Collection V1. Truman State University Special Collections.